When warmer weather finally decides to show it's face it tends to bring that dreaded look into our closet for something to wear. We've only had a couple warmer weather days so far but every year the same thing happens ....I hate everything in my closet! Does this happen to anyone else? Not yet ready for shorts, jeans are too hot and you want to be comfortable and still look put together. Every year I find myself wanting to add more casual dresses to my closet. Throw on a cute necklace, some cute sandals and you're good to go. 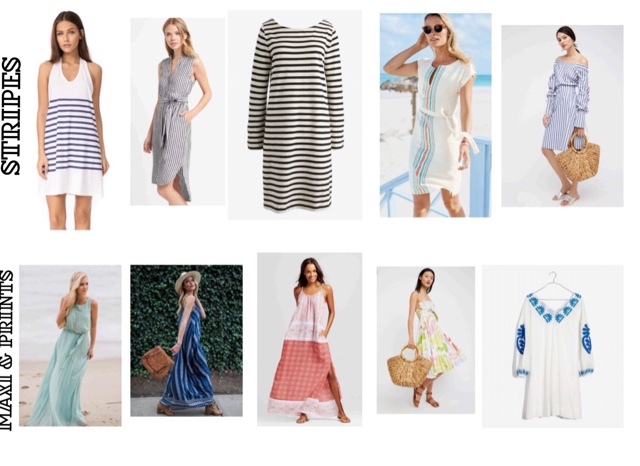 I'm loving the season trends of off the shoulder, one shoulder, linen, chambray and stripe dresses right now. So I've scoured the internet searching for great dresses to add to your closet and here's what I came up with. Please share any great dresses you've spotted. I'm always on the hunt for more. Neutrals are always great summer choices because you can dress them up with fun colorful accessories or throw on a fedora and strappy flats for a more casual look. I got a similar black fitted cotton dress from Athleta last year and wore it so much more then I thought I would. This is a similar style from evereve. You can't go wrong with a black midi dress. I also love a pretty white dress. The detail on the top of this is so delicate and I love the relaxed style. The off the shoulder trend is HUGE right now. I feel like everywhere I look, this is all I find but I do love the look. Although this style probably isn't the most user friendly if you're chasing around little kids, it's great for a beach coverup or a casual night out. I recently got the Banana Republic chambray off the shoulder dress and it's really cute in person. It looks plain on it's own so I paired it with a cute braided belt and a pair of wedges and these tassel earrings. As I was looking for dresses I kept adding striped dresses to the list. I tend to gravitate towards stripes in the summer. 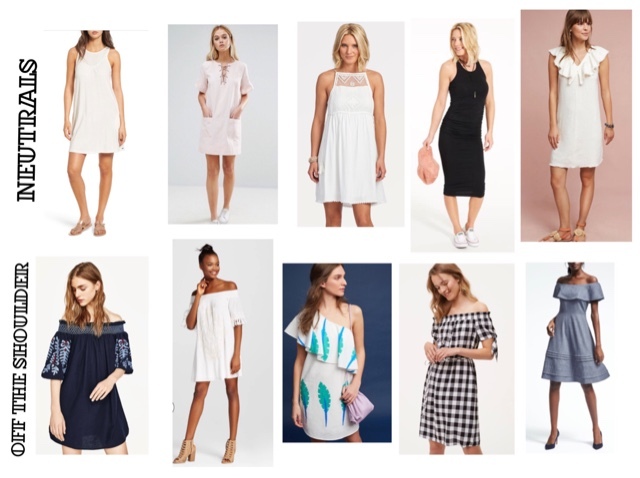 Lots of cute options from the casual t-shirt dress to an off the shoulder blue and white dress that can be dressed up for a night out. I'm really loving this Boden one! A casual striped t-shirt dress pairs great with a jean jacket and booties on days that its cooler. Maxi's and bright prints are a must for summer time. Super comfortable and great as coverups too! This pleated aqua maxi from Vici Collection is my favorite color and looks great with a tan! They have so many great dress options including this blue one. There is a line at Target called Knox Rose and its the cutest boho collection. I haven't seen this dress in person but I love the color and style. A maxi is your go to, don't have to think about putting something together summer look. You can shop all these dresses below. There are lots of great sales going on too!